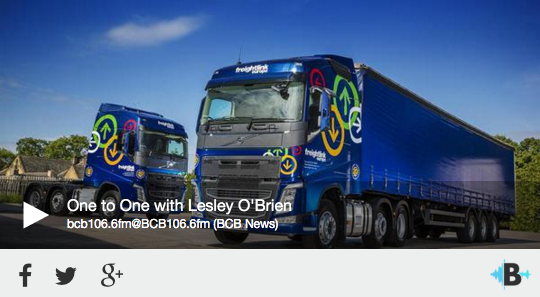 Lesley O’Brien talks to local radio station bcb about her life in the haulage industry and shares some of her favourite music. A big thank you to our customers and suppliers for supporting us on our journey. Click here to read Volvo Truck’s press release. 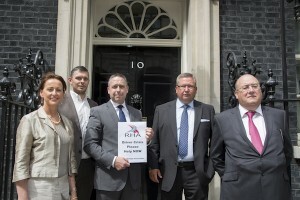 Last month Lesley accompanied RHA Chief Executive Richard Burnett to deliver a petition to Downing Street. The petition was to highlight the driver shortage and ask for funding for licence acquisition and to assist younger people to join enter industry. Freight Train Driver CPC module 6 covers Civil Penalties Code of Practice (migrants), customer care, vehicle and driver security. From 00:01hrs on Monday 6th April 2015 the speed limit for Goods Vehicles exceeding 7.5 tonnes will increase to 50mph on single carriageway roads and 60mph on dual carriageways in England and Wales, unless lower local speed limits are indicated. The Highway Code says a dual carriageway is a road which has a central reservation to separate the carriageways. This can include one lane in either direction. Amendment to Rule 96 on driving under the influence of drugs or medicine. Illegal drugs have been specified at very low levels so even small amounts of use could be above the prescribed limit and the active ingredient in the drug can last for a long time. The limits for certain prescribed and over the counter drugs have been specified at higher levels, above the levels generally found in the blood of patients who have taken normal therapeutic doses. You can raise a statutory medical defence, if you are found to have a concentration of a drug above its specified limit in your blood because you have been prescribed or legitimately supplied a particularly high dose of the specified medicine, as long as your driving is not impaired by the substance you were taking. Prescribed and over the counter drugs can be just as dangerous always check label. It may not be obvious if the medicines can cause impairment. In relation to the above changes Police now have new powers and new kit to test to see if a driver has a drug in their system. The test will now be carried out at the roadside in a similar way to drink drive testing. Drivers may then be put through the Field Impairment Test. Sixteen legal and illegal drugs are covered by the law, including cannabis, cocaine, ecstasy and ketamine. 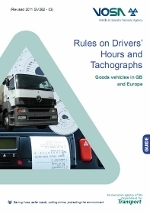 From 2 March 2015 the journey distance for being tachograph exempt will increase from 50 km to 100 km from the operator’s base. The syllabus for Driver CPC training is set out in the European Directive 2003/59/EC. Whilst all courses must comply with this syllabus, individuals and companies have been able to choose courses according to their individual training needs. The Driving Vehicle Standards Agency (DVSA), which is the competent authority responsible for the approval of training centres and periodic training courses has announced today that it has been asked to ensure that periodic driver CPC training specifically takes account of other road users, particularly those that are vulnerable. The DVSA has issued guidance for training companies and transport operators – click on the image to the right to download. Freight Train’s Driver CPC courses continue to promote driver safety and the safety of all road users. For details of Freight Train 2015 open courses, please click here. There are ongoing weather warnings for snow, ice, strong winds and heavy rain. 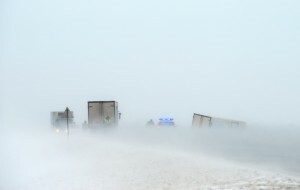 Slow Down: Distances are increased by up to 10 times in snow and icy weather. Plan Routes: Check latest weather conditions and continue to listen to travel bulletins. Be Prepared: Carry a map – don’t rely on sat navs, carry a snow shovel, de-icer. 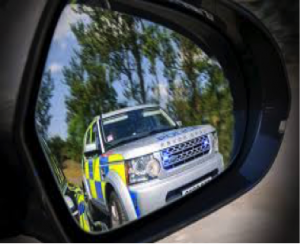 Vehicle Check: Be more prudent when carrying out vehicle checks, especially when checking tyre tread, visibility (lights/mirrors – drivers must be able to see and be seen). Clothing: Carry extra, warm clothing and suitable footwear. Food: Carry sufficient food and a flask of a hot drink. Phone: Ensure mobile phones are fully charged. 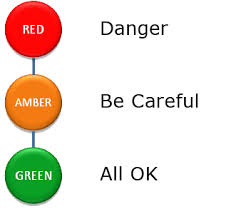 Gritting Vehicles: Flashing amber beacons usually indicates they are clearing snow – overtaking could mean driving into a hazard. High-sided vehicles are particularly affected by windy weather but strong gusts can also blow a vehicle, cyclist, motorcyclist, or horse rider off course. Large goods vehicles drivers should therefore pay particular attention when passing vulnerable road users or on open stretches of road exposed to strong crosswinds. Slow Down: Strong winds impact on a driver’s vehicle control. Curtain Sided Vehicles: When unloaded, drive with curtains secured in open position. Vehicle Checks: Be extra vigilant when checking that everything on the vehicle is secure. Slow Down: Stopping distances are at least doubled in wet weather – more for heavy goods vehicles! Drive Courteously: Remember spray from large goods vehicles can impair vision for vulnerable road users and affect their safety. Vehicle Checks: Pay particular attention to tyre tread depths, visibility (lights/mirrors), demisters, windscreen wipers. Carry out thorough documented pre use checks and report any defects. Lights can get filthy with all the spray in winter. Keep them clean and check bulbs regularly to be prepared for lower visibility. Ensure tyres are correctly inflated. Make sure wiper blades aren’t worn to ensure the windscreen is clean to ensure continued visibility when coping with extra spray, ice and rain. Freight Train – Driver CPC approved course ‘Workplace Welfare’ covers safe driving in adverse weather – contact Freight Train on 01274 608900. 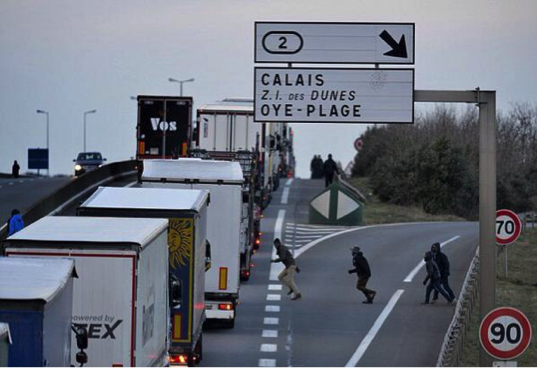 This month Lesley O’Brien represented the Road Haulage Association in a BBC news interview highlighting the plight of UK haulage industry traversing Calais. The UK government has pledged £12 million over the next three years to improve border security in both Dover and Calais, but UK hauliers and drivers must play their part in carrying out documented security checks in accordance with Home Office Guidance. The current penalty is £2000 per clandestine for both the company and the driver. This amount is currently under review, under threat of being increased! Companies should comply with the Home Office Civil Penalty code of Practice. Drivers should ensure strict compliance with the procedures put in place. 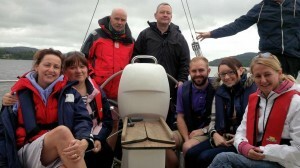 Massive thanks to customers Sarah and Mark Lofthouse for treating the Freightlink Europe team to a sailing trip on Windermere. At the recent Women of Achievement celebration lunch in aid of Sue Ryder, Sarah Lofthouse successfully bid for a sailing day on Windermere and very generously asked members of the Freightlink Europe team to join her and Mark. Everyone enjoyed sailing the 38 foot Bavaria yacht and a gourmet meal on board in the evening. 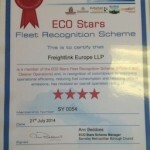 As the Freightlink Europe fleet of tractors expands with the addition of 3 Mercedes Actros 2545 tractor units, Freightlink is pleased to achieve Ecostar 4 star status. As the deadline for the Driver CPC approaches (10 September 2014), Freight Train has been forced to add additional dates to meet customer and driver needs. Check that all drivers have received their Driver Qualification Card (DQC) and carry it whilst driving. Check that none ‘acquired rights’ drivers (those who took their test post September 2009), took modules 2 and 4 of the driving test and have their DQC – if not they are driving illegally. 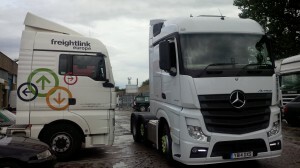 Acquired Rights Drivers – the tick off dates for DQC card renewal fixed 5 yearly dates – 10/9/19, 10/9/24, 10/9/29…………..
As customer demand grows, the Freightlink Europe fleet is expanding. We now have a fleet of tractors available for traction throughout the UK. We are currently test driving the Mercedes Actros, which is claimed to offer massive fuel consumption gains. Based on driver comfort alone Tom Peterson, Freightlink’s Operations Manager is already a fan and has enjoyed test driving the ‘beast’. Is your Operators Compliance Risk Score (OCRS) in jeopardy? The DVSA has conducted a consultation with a view to allow the issue of Fixed Penalty Notices (FPN) retrospectively. Currently DVSA can only issue such penalties for current infringements. If the ruling changes, this could have a massive financial impact on drivers, who could see an increase in the number of fines they receive at the roadside. This much quicker, easier and financially beneficial way of issuing penalties also puts an Operator’s Licence risk as FPNs impact on the OCRS, resulting in more roadside stops and the risk of Public Inquiry. 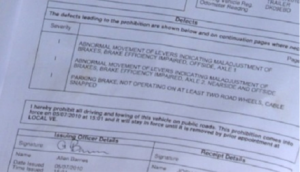 Of course drivers and operators who always comply with regulations have no cause for concern. Freight Train’s mission is always to assist drivers and operators alike in remaining compliant, through Driver CPC training and consultancy, ensuring that neither the driver’s licence nor operator’s licence are at risk. The Operator Licensing Central Office has announced that Operators are no longer required to notify the traffic Commissioners of isolated prohibitions. However should there be a number of prohibitions within a short period of time or a serious prohibition, then the requirement remains that the traffic commissioner must be advised within 28 days. The issue for operators is what constitutes a short period of time? Could operators come under scrutiny for not advising the Traffic Commissioner? By advising the traffic commissioner an operator is not only able to provide a documented audit trail of the investigation and any corrective action taken, which may be required at any future Public Inquiry, but is also able to evidence ‘continuous effective management’ – a requirement for all Transport Managers in order to retain their ‘good repute’. The Road Haulage Association (RHA) is currently awaiting clarification on this point. REMEMBER: Prohibitions, convictions, graduated fixed penalties all impact on an operator’s OCR score. On 21 and 22 June 2014 a group of barristers from Exchange Chambers cycled from Liverpool to Manchester to Leeds to raise money for Claire House Children’s Hospice, Francis House Children’s Hospice and Martin House Children’s Hospice. 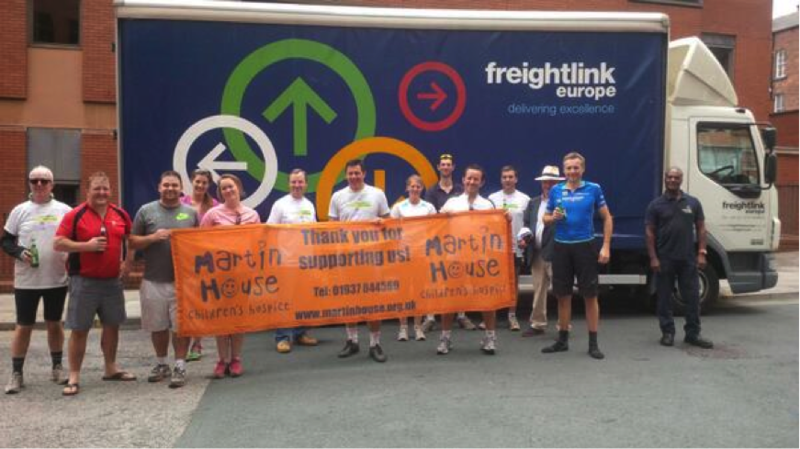 Freightlink Europe was pleased to sponsor such a worthwhile cause and to assist in returning the bikes back from Leeds to Exchange Chambers in Liverpool and Manchester. A quick note to say thank you from all at Exchange Chambers for your fantastic generosity in collecting and transporting our bikes back from Leeds to Liverpool and Manchester at the end of Le Tour D’Exchange. You no doubt get inundated with charity requests and so for you to provide your services to us as virtual strangers is a truly outstanding gesture. It re-affirms what everyone I have spoken to about you says, namely that you truly are lovely and generous people. A mention also for your staff members, Paul and Tom who were friendly and professional and provided us with an absolutely first rate service. We are now beyond £22,000 in sponsorship money raised and, with a fair wind, we are hopeful of reaching our £30,000 target. 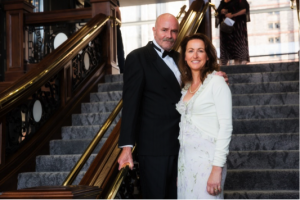 On Friday 20 June 2014 Lesley and Kevin O’Brien were delighted to be invited to join the team at Backhouse Jones Solicitors to celebrate achievement in our industry at the newly finished prestigious Titanic Hotel in Liverpool. It was a delight to celebrate achievement in our industry. From 30 June 2014 every employee has the statutory right to request flexible working after 26 weeks employment service. (Before 30 June 2014, the right only applied to parents of children under the age of 17 (or 18 if the child is disabled) and certain carers. On 7 May Freightlink Europe’s sister company and training arm hosted a truck and cycle safety day at University Academy Keighley (UAK). 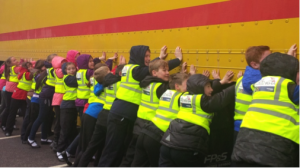 Over 140 school children from throughout the Worth Valley attended to learn about large goods vehicles’ (LGV) blind spots and dangers on the road. West Yorkshire Police also discussed the dangers on the road and the role of the Police. 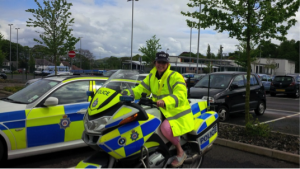 Children were given the opportunity to sit in a police car and on a bike and switch on the sirens. 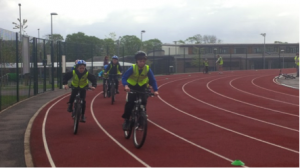 John Dennis, Former Chair, Bradford Cycling Forum, kept the children entertained between sessions with a Top Gear style round the track cycling challenge. Massive thanks to Busoasis who entertained children on their educational bus and kept all helpers provided with tea and coffee throughout the day. Thanks also to the RHA and Nicola Pulford of Freightlink for their attendance throughout the day ensuring the event ran smoothly and everyone was looked after. Download Freight Train truck driver and cyclist safety advice by clicking here. On 9 May 2014 at a luncheon sponsored by Morrisons Supermarkets at the Royal Armories in Leeds, Freight Train’s Managing Partner and business owner, Lesley O’Brien was awarded the Sue Ryder Yorkshire Business Women of the Year Award for 2014. The business sector had over 20 inspirational finalists and Lesley was therefore both proud and thrilled to receive this accolade in recognition of her contribution to the transport industry over 30 years. 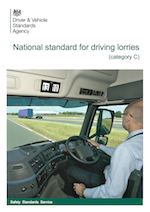 In May 2014 the DVSA released a revised Guide to Maintaining Road Worthiness, which contains vital information on how to ensure transport operations remain compliant with regard to vehicle maintenance and workshop standards. The guidance has been revised to permit operators to arrange for inspections to be carried out within specific ISO weeks, as opposed to on a fixed date interval. ISO weeks are fixed global week numbers.. Weeks commence on a Monday and finish on a Sunday. The guidance gives specific guidance for traction operators. Traction only operators need to remember that even though they do not arrange for trailer inspections, they are still responsible for the roadworthiness of the vehicle when on the road. Any prohibition will count again the operator’s own Operators Compliance Risk Score. It is recommended that operators have a system to check the maintenance regime of the trailer operators and that drivers are extra vigilant in their walk round checks. Freight Train has organized a safety event to promote safety for vulnerable road users around LGV vehicles. The event shall take place on Wednesday 7 May at University Academy Keighley (UAK). The event forms part of the 100 cultural build up the Tour de France. Whilst the haulage industry supports the government’s desire to promote cycling, it is essential that mutual respect and understanding between cyclists and LGV drivers is also promoted. Click here for an overview of the day event and here for the evening event. Drivers and business owners are invited to come along to network and take part in the evening debate. Congratulations to Tom for passing his Transport Manager CPC exam first time. Tom applied himself and worked incredibly hard. We are delighted for him and are sure that the knowledge gained will benefit him in his career progression with Freightlink Europe. Transport for London’s industrial HGV Task Force* has this month prosecuted a haulier after one of its drivers was found to be driving without a Driver Qualification Card (DQC). This is believed to be the first case of its kind. The haulier received multiple fines and the driver received a £400 fine. This case involved a newly qualified driver. Increasingly Freight Train is coming across LGV drivers, who have passed their LGV driving test post 10 September 2009 and received a driving licence, but have failed to complete modules 2 and 4 of the driving test. Modules 2 and 4 are the Driver CPC elements, which an LGV driver requires in order to drive professionally. After completion of these 2 modules, the driver will receive a Driver Qualification Card. The card is valid for 5 years, during which time the driver must complete 35 hours of driver CPC periodic training in order to receive a DQC for a further 5 years. This is an ongoing process. Drivers who acquired their vocational licence pre 10 September 2009 benefit from ‘acquired rights’ and these drivers have until 9 September 2014 to complete 35 hours of Driver CPC periodic training in order to receive their Driver Qualification Card. It should be noted that approved Driver CPC periodic training centres are only approved for to deliver periodic training and not modules 2 and 4 of the initial LGV licence. To lease or not to lease – click here for article.